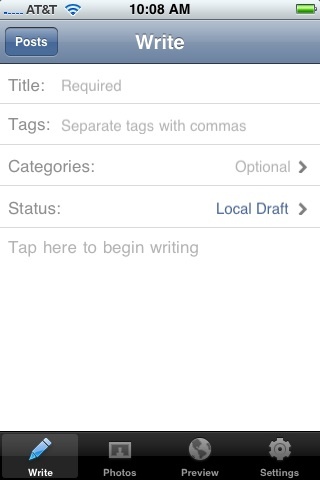 This is a test of the WordPress iPhone app that enables you to easily update WP blogs from your iPhone. I will be disappearing this entry shortly after it has been published. For those of you who do see it, the secret word is “intaglio”. Update: Might as well leave this up and turn it in to a review. It was pretty smooth sailing for the most part, with a v. forgivable snag or two. Setup was easy — after a username/password/URL, it set up my blog for iPhone updating with no problems. Some might worry about storing that authentication information on their iPhone, but for me the security tradeoff is worth the convenience. I might start password-protecting my iPhone main screen, though. The new entry creation process was easy and straightforward, and included all of the fields I wanted. To publish a new entry, instead of hitting a “publish” button, you tap the Status menu, change your entry to “Published” and tap Save. As you’re writing you also have access to a Photos tab, and I didn’t notice at the time that if you hit “+” in the bottom right corner, you get the option to grab a photo from your iPhone Library or take one on the spot and integrate it into your blog entry. Neat. There’s also a full preview available with the app’s integrated Safari browsing. My first time through, after I saved my draft, I pressed “Posts” and got ejected back into the iPhone main interface, meaning the app had crashed. It did so gracefully, and when I went back in, my saved draft was still there. As far as the overall experience of writing via iPhone, it’s great in a pinch or when I want to publish something quickly, but I expect it’ll introduce auto-correct errors like the one that crept into this entry — when I first published it, the iPhone in its wisdom changed “the secret word is intaglio” to “the secret word in intaglio.” Also, I initially didn’t capitalize each word in the title of this entry as I usually do, because it seemed like a great deal of effort to pull that off on the iPhone. That’s not a big deal when time is of the essence, but I’d stop short of trying to write longer entries on the virtual keyboard. Via Weblog Tools Collection, WordPress for iPhone also features “Auto-recovery – This will recover posts which have been interrupted by phone calls.” Not bad for a free, 0.3MB application that sits on a mobile phone. Here’s the Official announcement at WordPress, a detailed write-up at Weblog Tools Collection, and a link to download it via iTunes. Update: Capn Ken encountered a crashy bug as well. And Lance has a review of a similar app for TypePad blogs. Dave, nice work. I’d like to add another use case. I really see myself editing and proofing existing unpublished articles, in some spare times when I’m not by my computer. I’m hoping this app may get me to push more unfinished thoughts into the blogosphere. I can see myself using this iphone app instead of that special flickr e-mail address to send photos to your blog. I think this will be a great drunkblogging tool. I don’t trust myself around beer and a $2,500 laptop, but I’d have to be trying pretty hard to spill beer on my iPhone.